Qualcomm says that Apple CEO Tim Cook is being 'misleading' when he commented that there have not been any recent settlement discussions over the pending iPhone modem court case. Responding to Tim Cook's interview that aired on Tuesday, Qualcomm takes issue on comments about settlement talks. Asked on CNBC's Mad Money about the lawsuit, Cook refuted the suggestion there were active discussions with Qualcomm on the matter. "Look, the truth is, we haven't been in any settlement discussions with them since the third calendar quarter of last year," claimed Cook, insisting "That is the truth." Cook went on to state "I'm not sure where that thinking is coming from." In response, Qualcomm told Reuters Cook had miscast CEO Steve Mollenkopf's comments from November about the issue, statements which did not mention a settlement and that Qualcomm maintains are accurate. Mollenkopf's commentary advised the two firms "talk as companies" and goes on to call the situation "the fourth quarter of the game, and not the first quarter." The CEO also brought up about being "really on the doorstep of finding a resolution" in late 2018 or into early 2019, but does not explicitly confirm or deny any such talks are occurring. The existence and denial of talks has been a frequent topic of reports on the subject. In early November a report source from Apple advised "There is absolutely no meaningful discussion taking place between us and Qualcomm, and there is no settlement in sight." When the date was set for the lawsuit on December 3, Apple attorney William Isaacson took a moment to declare "There have been unfortunate articles lately that the parties are close to a settlement, and that is not true. There haven't been talks in months." Regardless of whether talks are happening or not, the two sides will face off in court on April 15. The suit in question started in January 2017, with Apple alleging Qualcomm had withheld approximately $1 billion in royalty payments to Apple, in retaliation for cooperating with South Korean antitrust investigators, as well as other claims of extortion, monopolistic practices, and price gouging. Qualcomm followed up with its own filing, accusing Apple of attempting to pay less than the fair market value for access to Qualcomm's standard essentials payments, breach of contract, and wrongly inducing regulatory action in a number of jurisdictions, among other issues. Qualcomm later accused Apple of delivering trade secrets to Intel to improve the performance of its cellular modems. Mmm. So it looks like Qualcomm wants to negotiate, but Apple wants to go to court. Understandable, that'll open up Qualcomm's deals to a lot of scrutiny that they probably don't want. Tim Cook looks totally chill in that screenshot. Everything is hunky-dory, and everyone is insane raising any concerns. Watch it now, Cramer! 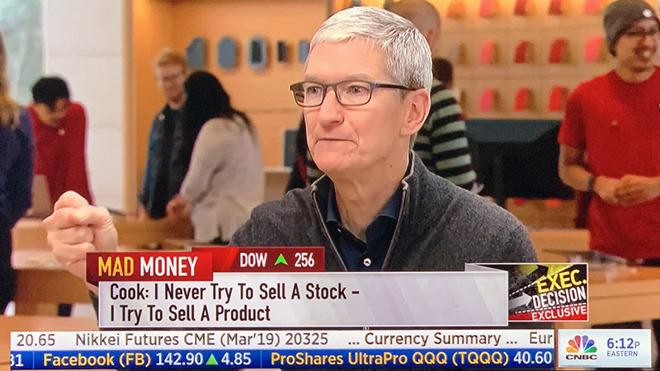 Tim Cook doesn't try to sell a product. He tries to invent new ways of shocking the buyers with the product's pricing into NOT buying the product. Exactly. More like one-side love proposal from qualcomm which Apple seems to be not interested in. This battle will keep going until Court settles. Apple defending what is Right and Qualcomm defending it's Cash Cow. Qualcomm: So do you want to sit down and negotiate a settlement? Apple: Sorry, no. We'll take our chances in court. Qualcomm: Good talk. Hope to do it again soon. See? We're communicating about a possible settlement. Simply put, I'll take Cook's word over Mollenkopf's any day.